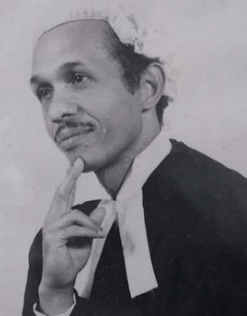 Cyril Landers was a Saint Lucian solicitor, politician, and former Senator. Landers was a former Senator of the United Workers Party (UWP) and served in the Senate from 19 October 1979 to December 1980. He was a practicing solicitor and an avid member of the Rotary Club of Saint Lucia. He was also a former Chairman of the Public and Teaching Service Commission. Landers was married to wife Euphina Lorna Landers. He was the father of six children - Kenneth, Sandra, Glenn, Rushin, Rusharn, and Lejarne. Landers died on 5 May 2018, aged 90. He was laid to rest on Thursday, 24 May 2018 at the Choc Cemetery following a service at the Minor Basilica of the Immaculate Conception, Castries, St. Lucia.